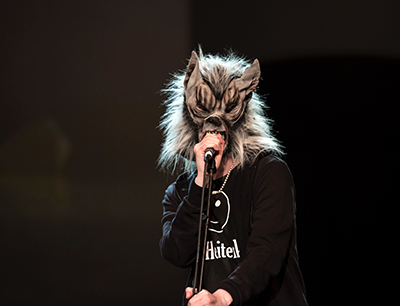 From the moment performer and electro-muso Julia*n Meding entered in his/her wolf mask I knew I was just going to love this show. In his/her (we’ll just use the masculine from here because Hamlet) walk-on physicality, Meding embodied that mask in such a way that I felt instantly connected. It had an immediately captivating, paradoxical ethereal viscerality. But, this confessional monologue of self-exposing personal stories and philosophical musings is not Men-In-Tights, and while I was engaged throughout, other people left the auditorium. It is contemporary performance art, using spoken text (in German with English subtitles), electropunk music, projection and stage lighting. Director and writer Boris Nikitin has sublimely integrated all of these theatrical elements to make a tender and extraordinary piece of theatre. 10.00 a.m. ‘To be’, 2.00 p.m. ‘Not to Be?’: is a co-existence of the two possible? asks Meding as Hamlet, searching for the possibility of being both alive and dead at the same time; mad and sane in the navigation of lived reality? For Hamlet it is the sense of being out of sync with the time that creates this decentredness from ‘reality’. He knows something is rotten in the state of reality, but all around the State is stating society is well and all is fine, and therefore he, Hamlet, is and has the problem: he is the crazy one. (The show surely asks: what is sanity in a crazy, rotten, mad society?) Of course, he is unstable. His father’s death, his mother’s hot marriage to his uncle, a visitation on the parapets of the castle by the ghost of his – he discovers – murdered father seeking revenge. That’s all pretty destabilizing stuff! And, not being a man of action, but a scholar, and a bit of an amateur actor, this calling to action brings on issues and questions surrounding agency, potency and power in the face of State power. And calls on us to interrogate our own individual sense of potency and power. Hamlet strategizes by playing the fool. Meding tells us that he finds his power in the gaze – gazing acutely at instances of ‘reality’ and, as both individual ‘self’ and ‘actor’, of being embodied by, and in, the gaze of the Other, which, of course, includes that of us, the audience. In the context of the use of metatheatre throughout, the actor then gets to insist on us, audience and actor, finding “solidarity”. There are no secrets. This in itself is quite a radical demand: warm bodies together in the theatre space building a communion of empathy and compassion in our common humanity. Hamlet is brilliantly theatrically conceived as an intensely personal, heart-breaking, intimate, riveting revolt. Hamlet’s run at the National Arts Festival is over but it is set to travel in South Africa. Keep a look out.